Do you like navy blue and in-you-face lime green? I sure hope so. The sun came out about 10 yesterday morning so after I got my hair all colored and cut I took photos of these beauties. Boy, you can’t help but smile when you look at those beauties. Patting myself on the back. The twin headboard and foot board came from My Favorite Junk Shop. I dont’ remember the price but I know it wasn’t much. Maybe $20. It was distressed already so I distressed it a little more. The color was really pretty so why paint it again? This is the nightstand I got on the 400 mile yard sale in June. 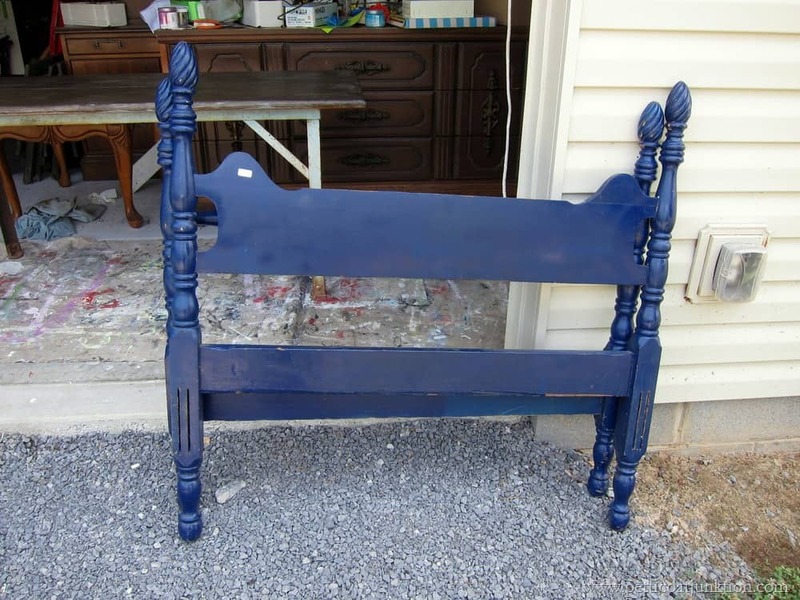 I decided to paint it to go with the navy blue bed…but what color? Of course I could have gone with white, or yellow, or red, but lime green sounded so much better. 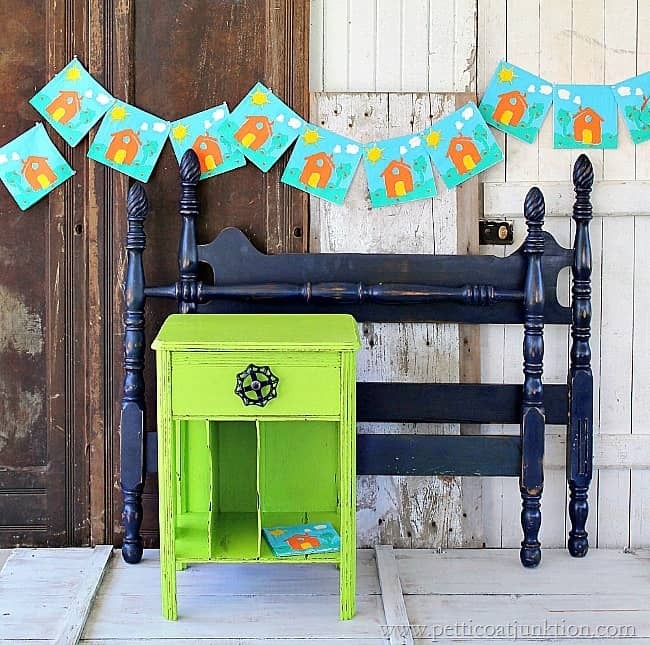 I pulled several green colors from my stash and decided on the Behr paint I purchased at Habitat Restore. When I popped the top on the can right after I brought the paint home, me and the JTS decided it was a really, really ugly color. Then a few weeks later I used it as an accent color on the turquoise and green radio cabinet and it looked great. Sometimes colors look better after you paint them on a piece of furniture and let it dry. Don’t make a hasty decision. The banner is made of napkins I purchased at the Goodwill.I didn’t know what I would do with them at the time but I loved the bright colors……surprise! 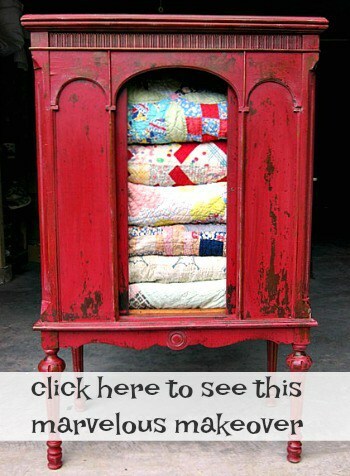 I didn’t actually make a banner…just tacked the napkins on the old doors. Of course the loud color called for a special drawer pull. I intended to spray paint the original pull with navy paint….. how dull. I found the perfect garden spigot in my junk stash and found a bolt to secure it to the drawer front. It’s a really fun touch and something unexpected. 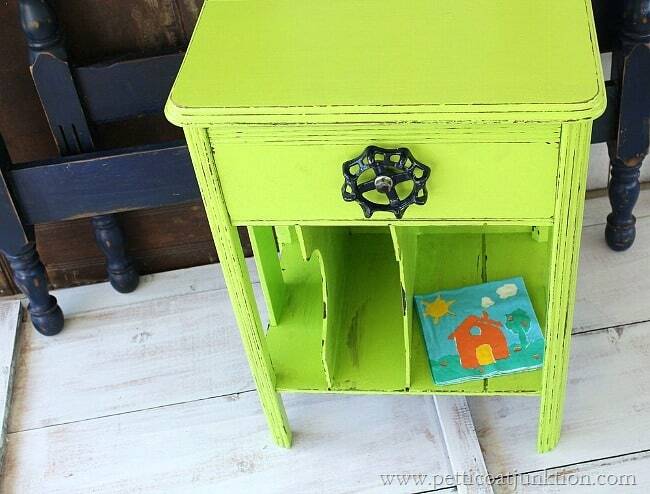 And of course I distressed the nightstand. 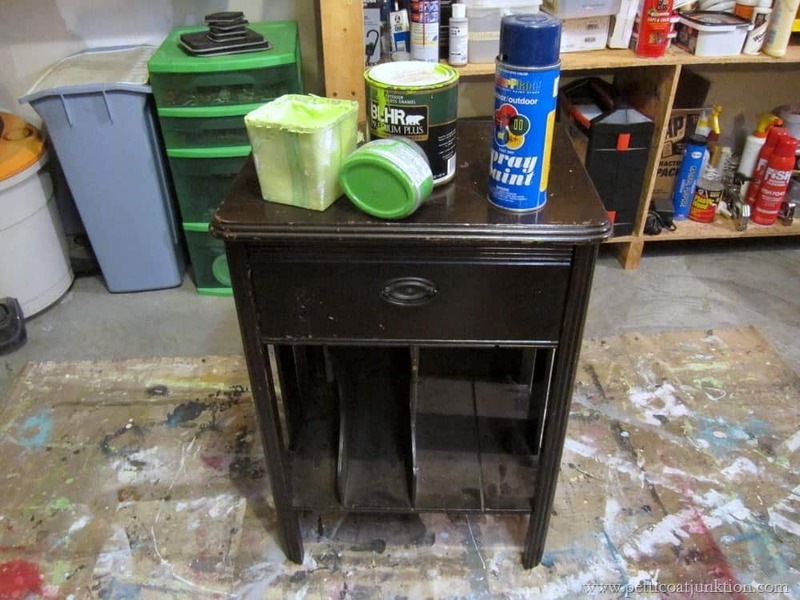 I actually waited until the paint was barely dry then used a rag dampened with Simple Green to wipe off the paint around the edges and the drawer details. 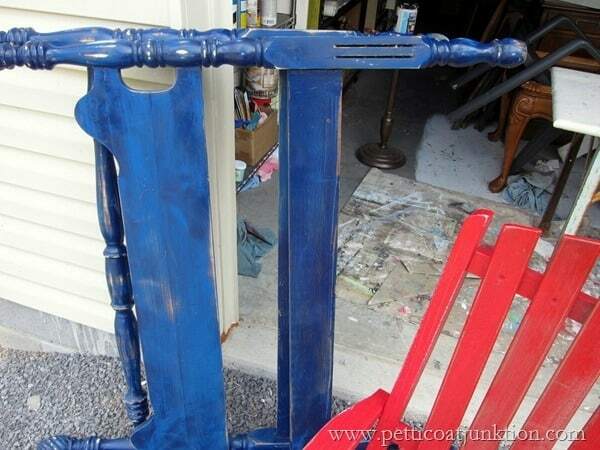 The bed received a coat of dark wax to deepen the blue color and to darken the raw wood in the distressed areas. If you enjoyed this bold project you will love this one….Turquoise and Metallic Silver Furniture. What do you think??? I know you guys are anxious to hear how the JTS is doing. We are no longer sleeping together…..got you didn’t I? He had a really hard time sleeping the first night home because of the medications and the pain…plus it was hard for him to get in and out of bed. (heart by-pass surgery if you are just now tuning in). He found that the couch in our living room is a good temporary fix! He also called the nurse and she added a medication to help with the pain. We are both sleeping better now. He is in some pain and tires easily but that is to be expected. these look fantastic! i love your keen sense of color. 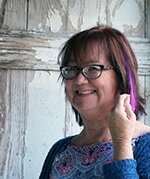 That’s a gorgeous color Kathy – and that spigot or whatever it is, is fabulous – what a great touch! I’m loving lime green right now – not sure if I have a market for it but on a personal level I love it !!! You stinker, teasing us that way, not sleeping together. Very important not to wait before taking pain meds, have to keep them in system continually so they’ll work. I had both knees replaced so was on pain meds for while after each one. I didn’t get addicted either. My body let me know when it was time to go off them onto over counter pain relievers. He’ll need to take them say 1/2 hour before the time is up on previous dose to keep them in his system to work well. If he waits til minutes after the last dose the pain will be harder to soothe. If he takes them every 3-4 hours. then take them say every 3 1/2 hours or if they’re for 3 hours then take them 2 1/2 hours between. It’s much more effective. The doc used to ask me if I needed more and at some point I’d say no I just take over counter pain relievers to sleep better or if I get any discomfort during the day. They made me sick to my stomach after while. Have to see how it works for him. Glad he found way to sleep better. I am not a back sleeper but had to or the pain was awful if I tried to lay on side. Having to get up to go to bathroom was awful as I’d get so cold I’d be shivering for few minutes when I got back in bed. Having surgery made me cold. Had both surgeries in winter, first in early Nov. and 2nd. Dec. 14th. I love that little record holder, works great for night stand. I’d keep my books stacked in bottom. The blue bed is gorgeous, that deep blue is striking. I have a thing for apple green but that’s a bit louder. Nothing wrong with that. When I paint our bedroom is going to be coral and apple green with some white maybe. I used to color my hair and cut my own but since it’s longer and my right shoulder is killing me cutting it myself is out. I gave up coloring when I was 67, just got tired of doing it. I had no idea you colored yours, goes well with your coloring. We were in roll over accident in 98, they think I must have stuck my arm out the window when it rolled over on passenger side, arm was broken all way across, just skin holding it on, shoulder was pulled. Had to sleep on a wedge with a body pillow to support arm broken and the shoulder. Arm was put in a support that my wrist was kept still and upper arm, had no control of arm at all, just hung there. Couldn’t dress myself or bathe on own. Neighbor would come over to help me bathe and dress. Bless her heart she was stuck with me for few months. I couldn’t go outside to walk as if I fell no way to get myself up. Believe me the way I felt walking around wasn’t something I was in hurry to do. Love the blue bed! Glad all going good. Sending best wishes…for both of you! This has been a summer of prayer for family and friends…can I add you in that bunch??? Love the bed and table too! Not repainting the was a great idea. I often do that if the look is already halfway to chippy. Wouldn’t have thought about the spigot for the drawer pull but it’s good. Glad to hear hubby is doing well. Thank the goddess for modern medicine. That green would certainly light a dark room! It looks great against the blue headboard too. I have been seeing those record/magazine nightstands EVERYWHERE lately! They must be all coming out of the basements…. lol. Glad to hear hubby is recovering. Prayers will continue. Have a great day Kathy! I love the bright green with the navy. The garden faucet handle is quirky, which I love also. Hope the hubby recovers fast. 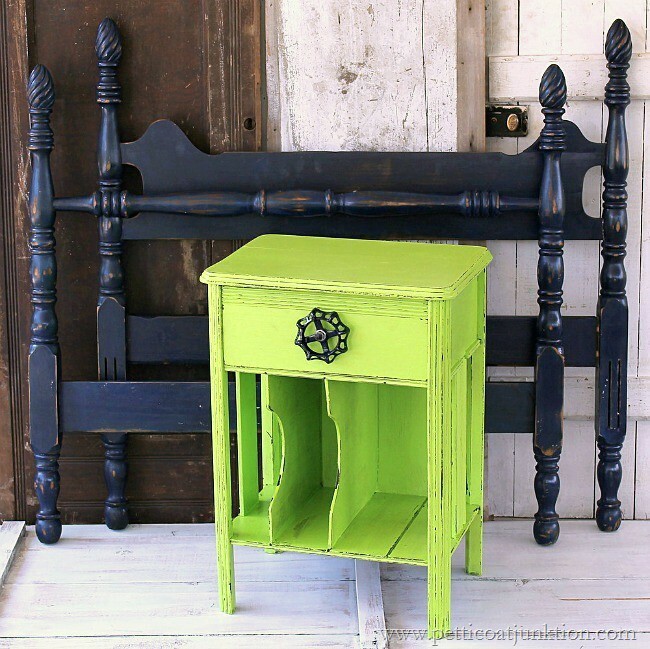 Love the little night stand and with the navy blue bed, well they are just perfect together. I will continue to pray for you and the hubs, so glad he is on the mend, it just takes time and lots of patients. I love that Green with the Dark Blue! Awesome idea. The pieces would great in someone bedroom along with Peacock décor. Still praying for you guys. Glad the JT got his pain under control. He has certainly had trauma to his poor body! I know he will be back to his old self again, real soon. Hugs! love that green!!! 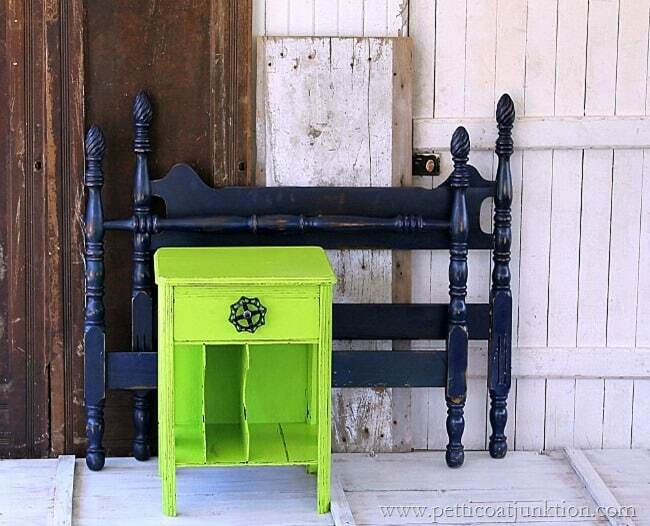 I like the idea of distressing while damp with Simple Green!! !